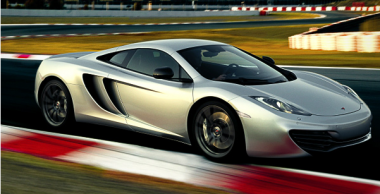 The McLaren MP4-12C, also simply called the 12C, is designed and manufactured by McLaren Automotive. It is the first production car wholly designed and built by McLaren since the McLaren F1 in 1998. The MP4-12C features a carbon fibre composite chassis, powered by a mid-mounted McLaren M838T 3.8-litre V8, twin-turbo engine developing approximately 616 bhp (459 kW; 625 PS) and around 443 lb·ft (601 N·m) of torque. The car makes use of Formula 1-sourced technologies such as “brake steer”, where the inside rear wheel is braked during fast cornering to reduce under steer. Power is transmitted to the wheels through a seven-speed seamless Shift dual-clutch gearbox. The chassis is based around a F1 style one-piece carbon fibre tub, called the Carbon MonoCell, weighing only 80 kg. The MonoCell is made in a single pressing by using a set of patented processes, using Bi-Axial and Tri-Axial carbon fibre multiaxial fabrics. This has reduced the time required to produce a MonoCell from 3,000 hours for the F1 and 500 hours for the Mercedes-Benz SLR McLaren, to 4 hours for the MP4-12C. The car has a conventional two side-by-side seating arrangement, unlike its predecessor the McLaren F1 which featured an irregular three seat formation (front centre, two behind either side). To make up for this however, the car’s central console is narrower than in other cars, seating the driver closer to the centre. Interior trim and materials can be specified in asymmetric configuration – known as “Driver Zone”. The car is powered by the M838T 3.8 litre twin-turbo V8 engine, designed and developed by McLaren in partnership with Ricardo. The design of the engine was based on a racing engine which was designed and developed by Tom Walkinshaw Racing for the IRL Indy Car Championship but never raced. However, other than the 93 mm bore, little of that engine remains in the M838T. It produces 592 bhp (441 kW; 600 PS) and 443 lb·ft (601 N·m) of torque. It has a Redline of 8,500 rpm, with 80% of torque available at just 2,000 rpm. When first announced, McLaren claimed that it would have a higher horsepower to carbon dioxide emission ratio than any internal-combustion engine available at the time. McLaren announced a small number of improvements to become available in late 2012, with the option to be retrofitted to existing cars free of charge. The engine NOW produces 616 bhp (459 kW; 625 PS). |This power output has also become standard on the 2013 model. McLaren have stated the MP4-12C can accelerate from 0 to 60 mph (97 km/h) in 3.1 seconds and 0 to 200 km/h (124 mph) in 8.9 seconds. The car has a top speed of 207 mph (333 km/h) and can brake from 200 km/h (124 mph) to a complete stop in under 5 seconds. Braking from 100 km/h (62 mph) to zero can be done in under 30 metres (98 ft), around seven car lengths. That is impressive !